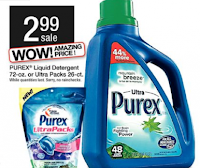 72oz Purex Laundry Detergent only $1.49 at Shopko! Wow, if you're lucky enough to have a nearby Shopko store, check out this hot deal you can get on big bottles of Purex laundry detergent! (or UltraPacks) Click here to see if there's a store near you. The sale is valid until 6/30 or until supplies last. Thanks, The Frugal Find and Discount Queens!